A Nagueño in the Blogosphere: Gutsy Gibbon rocks! UPDATE (4:00 pm): I have also resolved the VCD issue by installing MPlayer, as suggested by the blog Only Ubuntu Linux. 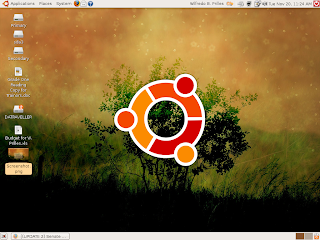 WELL, WHAT can I say, except that Ubuntu 7.10, also known as Gutsy Gibbon, far exceeded my expectations. Dom's package (together with a nice blogger's t-shirt - thanks, Dom!) came in at around 9 am yesterday, and I wasted no time to get the upgrade up and running. By around lunchtime, I was all set -- meaning, my Konica Minolta laserjet is hooked up, and painlessly at that; my wireless internet connection to the access point at the office worked seamlessly; and my VLC media player played most everything I threw its way: DVDs, my Windows Media video files, and even my Welcome to the Black Parade Divx file. More importantly, I can now see all my files in my Windows hard drives -- something I couldn't do under Dapper Drake and XP. And software upgrades are both painless and seamless, especially if you get the hang of Ubuntu's synaptic packages. The only drawbacks remain to be the office network winprinter (the Canon LBP-800), its inability to play VCDs (not a major issue in these DVD days, but inexcusable because XP handles it so well), and my internal Conexant modem (which prevents me from logging on at home using Blast dial-up). But what the heck! One cannot have it all. Which means there is still a place for Windows in my computing life -- at home where it is the only OS that my wife and kids know about. But even that may change, especially if I convert the home desktop into another dual-boot system. Maray nang dai ka maestoryahan! very techno-savvy indeed! well, this only goes to prove that software do note need to be commercialized. free software and open-source software are indeed far superior than commercially-manufactured ones. this might be herald the end of the software giants like microsoft. the internet belongs to the world. now, software applications are becoming more universally accessible. thanks to the good-heated geeks out there. this migt be the start of a new computer revolution. down with bill gates! The original concept of the Information Highway was that all information should be free. The inventor/s of the Internet have that egalitarian vision. But predatory Capitalism took over. It's the same stor now with the TELECOM industry, wherein the consumers are bled-dry to buy the LOAD. I don't understand, why the load should expire, since it's not perishable. Will somebody explain ?